Decided to make a 3D shadowbox which measures 12 x 9 cms. I wanted to use a pastel pink & blue theme to keep it light and cheerful ! 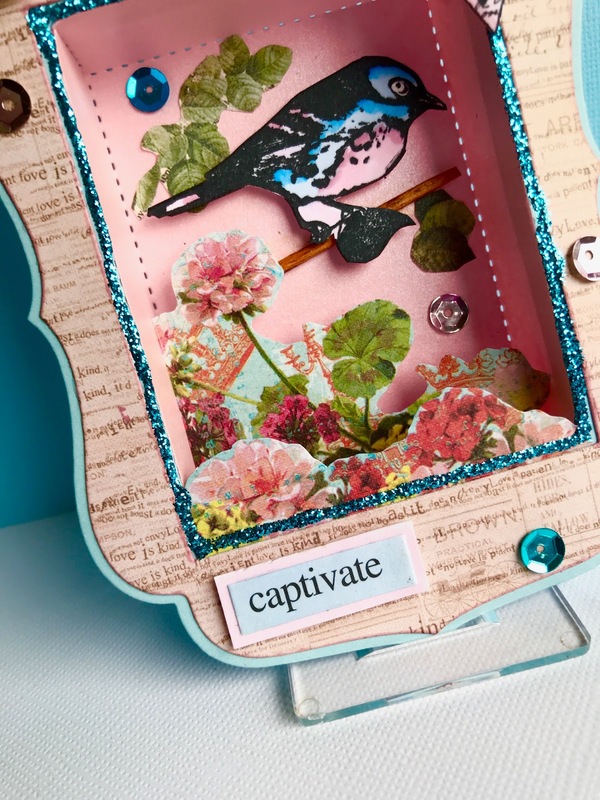 The shadowbox comes in three die-cut pieces and I used a pearlescent pastel pink card for the box and a pastel blue for the frame. 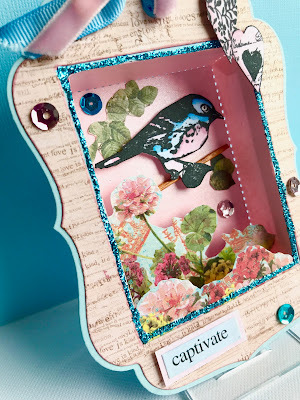 The two components were folded and glued together to form the shadowbox which I framed with some blue Stickles glitter glue. I then chose 3 printed papers from 6 x 6 stock and trimmed out the leaves and flowers which I stuck in place at different levels within the box to produce a 3D effect. I then stamped the Bird and hearts (Crafty Individuals) in black Memento ink and coloured as shown with Copic Alcohol Ink Markers before trimming out. I then took a wooden cocktail stick, trimmed to size and coloured with brown Copic Markers and stuck this in place with Glossy Accents onto which I attached the bird supported on foam pads. 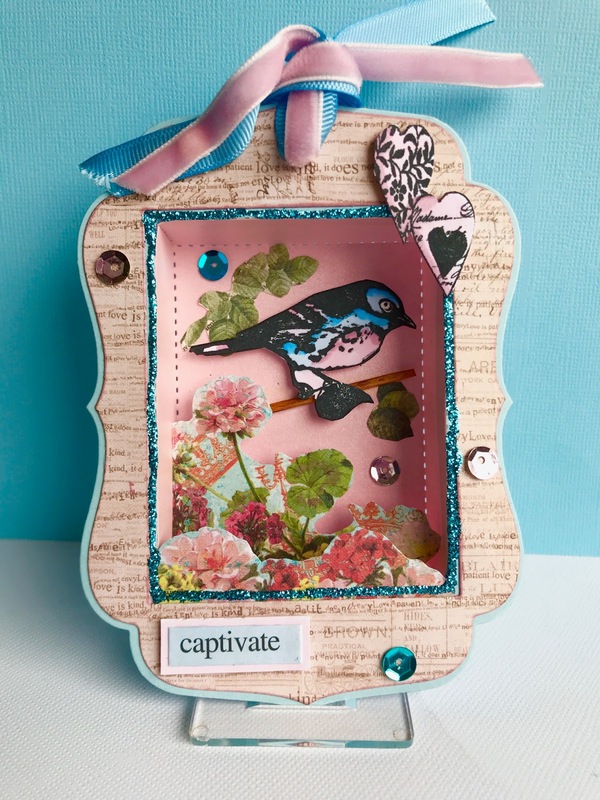 The pink frame was then also die-cut and stuck in place over the blue front. The stamped hearts were applied on foam pads top left and a number of pink and blue sequins attached with more Glossy accents added to provide some bright elements to the design. Finishing touches were to add some pink velvet and blue grosgrain ribbons tied through a hole at the top. The word 'Captivate' was stamped on blue card which was trimmed and matted on pink card & applied on foam pads to finish. I have stamped on the background using Archival black & Brilliance inks and embellished with floral diecuts and leaves using handmade mulberry papers applied with Glossy Accents as the postcard will travel 'naked' through the post. The sentiment is stamped and enhanced with white Posca pen. 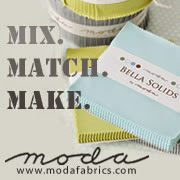 The whole postcard is edged with green Versamagic ink and the whole thing sprayed with matte acrylic lacquer to protect. Click HERE to join the UK Stampers Forum it's Free, Friendly & Fun !!! Easter is nearly here so used some cute bunnies to which I added pompom tails. 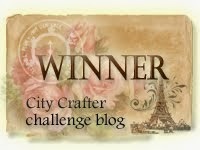 Do join the Forum if you enjoy stamping and papercrafts ! Click HERE to go there ... it's free, friendly & fun ! First I added two strips of purple Washi tape as shown. Then I took a green hexagonal wooden frame which I backed with coloured and stamped paper and stuck in place. Onto this I applied some green embossed die-cut leaves and a small square of coloured card. I then added a glas heart cabochon and a gold metal tree embellishment. Two wooden laser cut birds were then added on foam pads. The sentiment was stamped onto white card in black Versafine ink, trimmed, edged in fuschia chalk ink and applied on foam pads. Some small purple pearls were added to complete the card. I used recycled cereal packet for the bases which I cut to 2.5 x 3.5 inches in size. I then selected some printed paper and cut to the same size. I then die-cut some circles and stamped with circles. I coloured a series of adhesive gems with the colours of the Rainbow and applied these on the circles. Other spots made to sparkle with Stickles glitter glue. I then stamped the stem in Versafine black ink, coloured with white Posca marker and applied the decorated circles on foam pads to make a sort of flower effect. I then also stamped the words and the arrow in more Versafine black ink. The ATC's were edged in black spots made with a Posca pen and edged with brown Versamagic Chalk ink to finish. If you fancy joining the Forum, Click HERE to go there ! This CAS card was made for a Challenge on UK Stampers Forum where the participants choose one of their stamps which then travels, on a monthly basis, around the group of 12 where they make something using your stamp ! The stamp was stamped onto white card in Memento ink and was coloured with Copic markers. 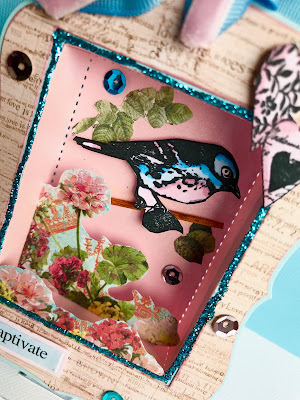 It was die-cut out and some Glossy accents were added to highlight areas of the image. A frame was made with white card which was embossed with a cross design and applied on foam pads. The printed words were also added on foam pads. 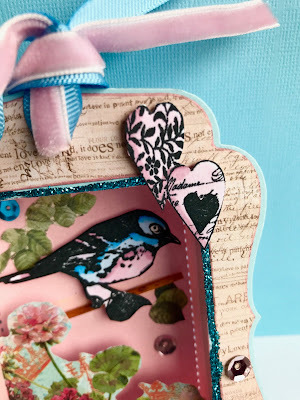 The background was made by stamping with Distress Oxides, the card was then embossed through the Sizzix Bigshot before selectively punching out the 1 x 1 inch squares. I then decorated the embossing with various pens ... some with glitter ! The printed words were edged in black and applied as shown. I have edged the Inchies with Versamagic Chalk inks to finish. If you fancy joining in the swap then click HERE to join the Forum .... its friendly, free & fun !! I'm a crafty fella living in Manchester U.K. I love nothing better than to escape into my very untidy craftroom and mess around with stamps, inks , paint, fabric & anything else that's crafty for that matter! A big warm welcome to 'Harpies Crafty Corner' which is a space to show and share my crafty creations and techniques. Hope your visit has been worthwhile and that you may have been inspired ! 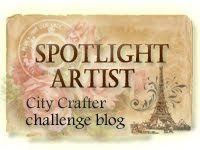 Please leave a comment, join my blog and most of all ....... enjoy !! Some of my creations can be bought in my Etsy Shop. I look forward to seeing you again soon. Why not follow my Blog ? You can also Pin any of my blog pics by hovering on the pic and clicking on the Pin-it button showing at the top of the pic. Visit Harpies Crafty Corner - my ETSY Store there is always something on sale ! Just Click ! Why not translate my blog into your language ?